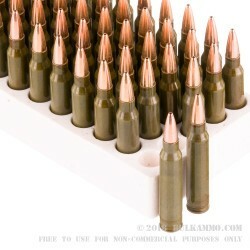 Hornady ammunition is renowned for being accurate, deadly, and dependable. The Hornady 75gr HBPT .223 Steel Match holds true to that timeless principle, and yet is capable of so much more. 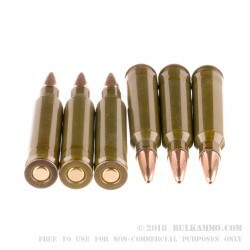 The .223 round is house in an all steel cartridge that is polymer coated and loaded with the same quality propellants as Hornady’s match level ammunition. This creates a round that is highly resistant to corrosion and oxidation, yet is stronger and less susceptible to cartridge deformation in the field. 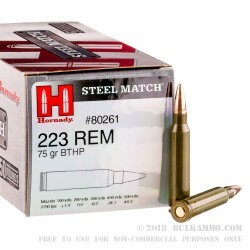 Loaded with 75gr hollow point boat tail rounds, the Hornady Steel Match .223 has a ballistic coefficient or 0.395 and is capable of supersonic flight out to a distance of 500 yards and beyond. The none expanding hollow point cavity serves to create a more aerodynamic envelope of air around the bullet in flight, while the boat tail recess at the end of the round stabilizes the bullet as it spirals in flight towards the target. Hornady 75gr .223 Hollow Point Boat Tail ammunition lives up to its reputation as being accurate deadly, and dependable, and the ideal round for hunting and other military and law enforcement applications where integrity and performance and valued above all else.